This past year I really changed my work-out routine and it's really for the better. I mean, who doesn't want a work-out that takes about half the time of going to the gym, gets better results and doesn't require paying for a gym membership. 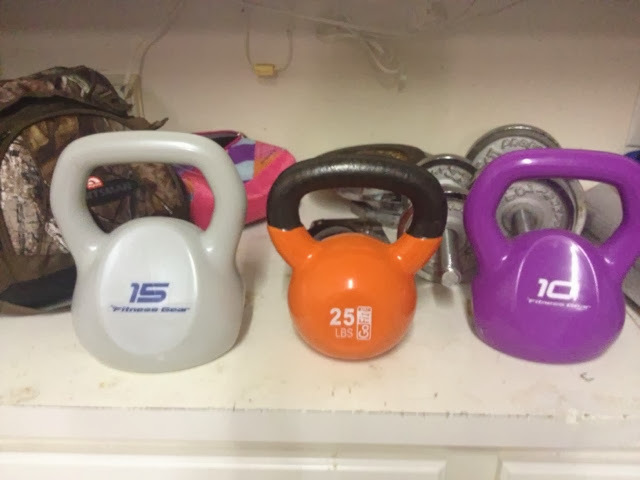 I'll tell you my secret, it's Kettlebells! See these 3 guys I have stashed in my garage? These really do the trick. I bought 2 to begin with, the 15# and 10#. I bought a cheap kettle bell DVD (which you really don't need to do) just to get the idea of how to do some exercises. I also checked-out a kettle bell book out at the library and did a youtube search for some exercises. Now I absolutely love it! And the best part, it's takes only 15-20 minutes to get a major workout. I instantly started seeing and feeling results. So now I go in my garage 3 mornings a week and turn on my music on my phone and really push it. It takes half the time that it used to take me to drive to the gym and do a weight work-out there. It's amazing! I won't post any exercises on here because I don't have any pics and I wouldn't want to tell anybody wrong. But there are plenty of resources out there. My husband got a kettlebell app on his phone that he really likes. A trainer talks him through all the exercises. I also already had some hand weights and an exercise ball. I do sit-ups and push-ups with the ball, plus a few leg exercises. Then I add some upper body training with the weights. So now my total work-out time is 25 minutes which includes some good stretching too. This is very timely -thank you! I have just been thinking that I need to work to get my body stronger again but I was a little unsure where to start with 5 littles in the house. This looks like a great idea -fun even! Thanks! Are you still doing THM? Have you found that to be sustainable? Hi Brandy, I still follow THM but pretty loosely. Once I reached my goal weight I started adding more crossovers and I've found that exercising daily (I take Sundays off) has kept me at my goal. I like to eat what I'm feeding my family and I'm really an "all things in moderation" girl when it comes to eating. I love southern food and love to bake and cook so if I eat way off plan, then I just up my exercising. Love this post I feel pike I am wasting so much time going to work out. Although I do enjoy the social side of it. 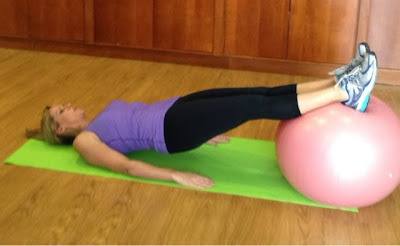 From another mom of 10 (mine are ages 25-4--5 boys and 5 girls), I love doing group classes at the gym--spin 2x a week and strength 3x a week and LOVE THM. Love your lifestyle and example. Thank you! Hi, Betsy again. I contacted you from main page. We homeschool until high school when we transition to a few classes at the local high school and part time homeschool. I have been extremely blessed by reading your blog... needed some "validation" and encouragement:) I will pray for you and yours today. I read that Post and got it fine and informative. Please share more like that. You can buy top quality gym wear online at optimal cost. Read your posts and find it very informative. I recommend to all of you to read this blog. Visit personal training if you are looking for professional personal training online. You have post the amazing blog. It helps the others to work out. If anyone is thinking to get the personal training then, Activenation will help you out. Thanks for posting about this.If you are looking for Personal Trainer Sw11,then you can contact titaniumbodies for more details. Personal Therapists is required for maintaining the diet. If you are looking for the Personal Training Gym Rockingham WA to sty fit and healthy then, they are the best gym with the best trainers in Australia. I must appreciate you for this great blog post. Personal Trainer can help you to remain fit and healthy. Thanks for sharing this blog post with us. information is very informative also you get same from Best rowing machine" this is the great resource to get such type of information of health and fitness. Learning exercise and gyming technique will help to keep fit and healthy. Hiring the Personal Training Clapham Junction who will guide you different techniques of the exercises. Reference- Paul, Benjamin. “ClenXDV Clinical Studies.” HGHOfficial.Com, i.e. HGH Official, https://hghofficial.com/clenxdv/. Accessed 8 Dec. 2018. Bibliography- Logan, Paula. “Apex-TX5 Clinical Studies.” Phenofficial.Com, i.e. PhenOfficial, https://phenofficial.com/reviews/apex-tx5/. Accessed 8 Dec. 2018. During the 1980's & 90's, the popularity of both at-home gyms and gym facilities skyrocketed, paving the way for the more personable, friendly gym to open. Good blog post. My personal trainer is required for maintaining the diet. If you are looking for Personal Training in Wien to stay fit and healthy then, they are the best gym with the best trainers in Austria. Thanks for sharing this fitness information post with us. Thanks for sharing this post. Gym technique is good for health and best for activeness. If you are looking for personal training online then you should visit our site Activenation.org.uk Personal Training.